Oxford Handbooks are always useful, but this one is particularly good. From the nuggets of wisdom it offers from old hands to new recruits, the weight of experience comes across clearly. Its section on clinical skills is especially handy because the editors have not omitted older procedures that have been almost abandoned as research and technology move forward. It is easy for junior staff to dismiss out-of-date procedures, but when the ultrasound won’t work or the patient is too unstable to risk a pelvic binder or there is an iron overdose, this kind of instruction can be invaluable. 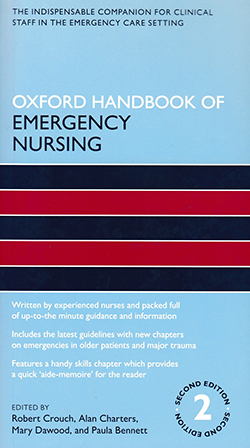 There is sufficient information on each area of emergency nursing, but possibly not enough depth for nurses who are passionate about a specific aspect of emergency nursing. However, the short sections lend themselves well to a quick refresher on a break or just before starting something new. I recommend staff who are serious about a career in emergency nursing purchase a copy of this book.